Jo Standing is an author, both a virtual and professional speaker centered in raw and real interpersonal sharing with an educational backbone. She is a seasoned decade plus yoga and self-empowerment classroom facilitator, an everyday spiritual warrior, and a CPC - Certified Professional Coach through Rhodes Wellness College in Vancouver, Canada. She studies, interviews, and is interviewed by doctors around The United States. She is dedicated to the path forward with the understanding of the growth that is inherent in the Post Traumatic Stress experience. Jo has taught personal wellness for over 10,000 hours since Spring 2005 to groups around North America. In 2017, she traveled 37,500 miles by Jeep around the USA with the effort to bolster the well-being of our country's warriors in uniform with lively, humorous, and in-depth talks. As the daughter of an Army Veteran who mostly raised her strength is not just a word. It is a way of being. Jo believes the knowledge of how to recover the self after trauma is everyone’s birthright. She also thinks the inner wounds of a warrior are not meant to be stuffed-away but rather used as signposts to live a full and rewarding life. Jo's work has been the subject of published articles for many years including in Natural Awakenings Magazine, USA TODAY magazine, and the distinguished online venue of Elephant Journal. She has been written about in Huff Post by Dr. Felicia Clark. She offers online and in person workshops, classes, and trainings. She is also a participant in speaking engagements that are geared toward being empowered through pain as we collectively shift as a society toward the doctor-recognized state of Post Traumatic Growth. 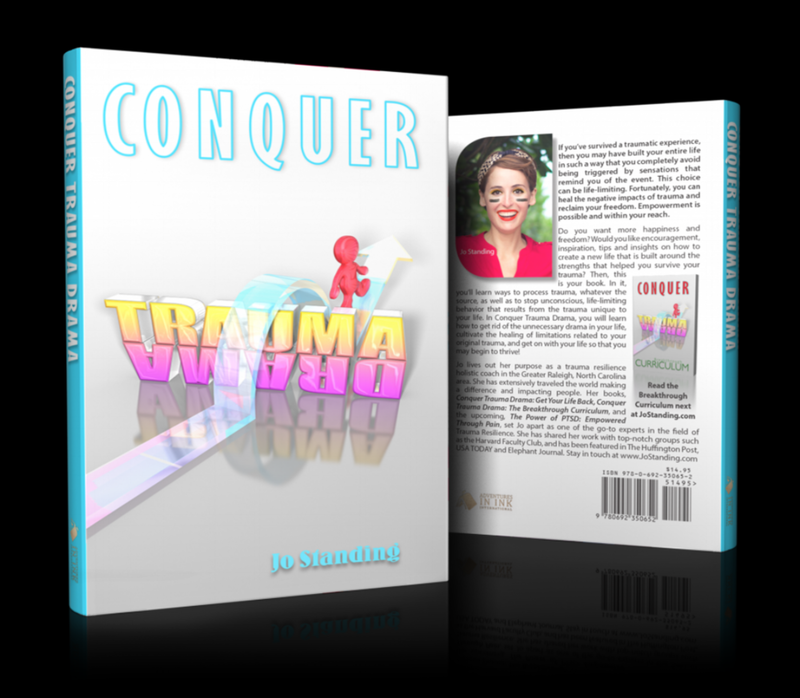 Conquer Trauma Drama: Get Your Life Back (282 pages) Published in 2015. Conquer Trauma Drama: Breakthrough Curriculum (141 pages) Published in 2016 and 2nd Edition 2017. The Power of PTSD: Empowered Through Pain - For Release Late 2020. Jo has earned the Successful Completion of her Advanced Certification in Hatha Yoga and Zen Meditation with Prana Yoga College. She is also Certified in Coaching after completing the full-time 6 month long program in 2013. BodyTalk Modality with Dr. Mary Shields in Columbus, Ohio. Jo has studied Body Psychology with Dr. Karyne Wilner and the Institute of Core Energetics in Providence, Rhode Island for 6 months. Jo is accepted into the Somatic Experiencing 3-year program both founded and developed by author Dr. Peter Levine. However, due to schedule conflicts will not be able to attend. This Page is copyrighted. ©️ Josephine Standing. All Rights Reserved. 2018 - Perpetuity. Medical Disclaimer: The information available from this website has been prepared and/or obtained for general information, education and/or reference and is not intended to provide medical advice. The owner of this website is not a licensed doctor and is not providing medical advice, or diagnosing or treating any condition you may have. We are not your doctor. The government advises that you do not act upon anything contained in this website without first seeking professional medical advice.